TACOMA -- A federal judge Friday ordered the longshore union to pay a $250,000 fine for vandalism and other illegal activity during September protests at the EGT grain terminal at the Port of Longview -- and he warned that individual protesters could face their own penalties for future violations of his orders. The amount was $43,000 less than attorneys for the National Labor Relations Board had requested to cover damage at the terminal, law-enforcement overtime costs and attorney fees. Attorneys for the International Longshore and Warehouse Union said they will appeal, arguing that the damage estimates were "general, unsubstantiated and inflated." "That's a lot of money," said union attorney Robert Remar. But U.S. District Court Judge Robert Leighton said acting quickly to impose a fine was more important than determining the precise amount of damages. He said he rounded down from the NLRB's original $293,000 request because he considered parts of it inflated. "I reject an argument that we need to delay. Everyone else wants to slow-walk it, except the (Cowlitz) County commissioners," Leighton said, referring to commissioners' request this week for expedited court action to settle the legal dispute between EGT, the longshore union and Port of Longview. "What's going on there is awful, and I'm going to do something about it," Leighton said. In addition, Leighton ruled that any individuals who trespass on rail tracks or break the law in future protests will be subject to a $2,500 fine. For union officers, the fine jumps to $5,000. Leighton also ordered a suspended $25,00 fine for the ILWU for protests on Sept. 7 and Sept. 8, when union supporters blocked an incoming grain train and then allegedly damaged the train and EGT property inside the terminal. A suspended fine means the union won't have to pay it unless it missteps again. 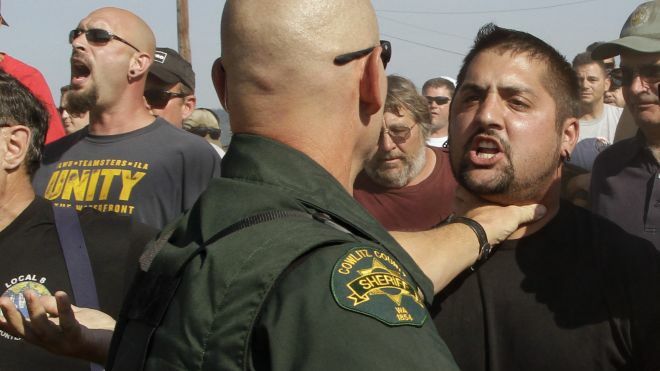 On Oct. 14, Leighton will hold another hearing on alleged violations of his contempt order in connection with a Sept. 21 protest in which 12 ILWU members and supporters were arrested for sitting on the tracks to block a train. Three of those arrested were affiliated with Longview-based Local 21 leadership: President Dan Coffman, Executive Board member Kelly Muller and Treasurer Byron Jacobs. Union attorneys say the three won't be fined if found in violation of the contempt order because their actions occurred before Leighton's Friday ruling. The union and EGT have been in a months-long dispute over the company's refusal to hire union longshore labor to run the new $200 million terminal at the Port of Longview. The union and the port contend EGT's lease agreement with the port obligates it to hire the ILWU. EGT disputes that. In a written statement, union spokesman Leal Sundet called Leighton's imposition of the fine "rough justice." "What the court engaged in here is back-of-the napkin guesstimates. There is no attempt to distinguish events arguably connected with what the union is accused of doing on the 7th and 8th of September 2011 and those events that are unrelated to any alleged union conduct," Sundet said. On Sept. 15, Leighton found the union in contempt of his civil order barring the blocking of trains and vandalism at the site. The week before, on Sept. 7, about 400 longshoremen stood on railroad tracks and blocked a train bound for the terminal for four hours. The next morning, hundreds of people broke into the terminal, smashed a security station, spilled grain from rail cars and harassed security guards. Union leaders blamed "wildcat" ILWU members for the damage and said the raid was not authorized by the leadership. "It is unfortunate that today's actions was necessary. Our society is bound by the rule of law, and every individual and entity must be held accountable for their actions," EGT CEO Larry Clarke said in a written statement. Nearly $140,000 in damage and compensation to EGT and $13,000 to Burlington Northern Santa Fe railroad. That includes $80,000 in lost grain for the 9,855 bushels spilled during the event. Damage to a railcar was just over $1,000 and damage to a security vehicle was $1,400. It also includes EGT overtime costs and lawyers fees. About $66,000 in NLRB attorney fees to compile the damage and compensation figures. If Friday's fine stands, NLRB will distribute it to affected parties on a pro-rated basis, according to Rich Ahearn, director of the NLRB Seattle office.